Martin, Tini and Magne. Oslo Domkirke, December 21st. Martin Halla and Tini Flaat Mykland performed the song “Falling Slowly” (by Glen Hansard and Markéta Irglová) at the “Desembertoner” concert in Oslo Domkirke on Friday, accompanied by Magne on piano. Martin and Tini also did a couple of songs on their own; “Take It With Me” (Tom Waits) and “Wintersong” (Sarah McLachlan). 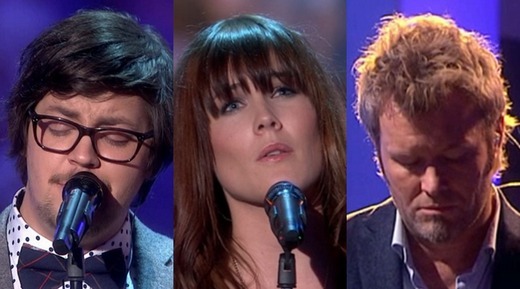 The whole “Desembertoner” concert can now be seen on TV2’s web-TV (subscribers only). “Falling Slowly” starts after 30 minutes. Martin and Tini also performed two songs together on “God Morgen Norge” on TV2 on Thursday morning; “In The City” and “Falling Slowly”. There’s a video clip here. Magne is producing the upcoming debut albums of both Martin and Tini, together with Martin Terefe. Martin Halla has been interviewed by Aftenposten in connection with the upcoming Desembertoner concert, where he’ll be performing together with Magne. – How will the album sound? The album is planned for release sometime in the spring of 2013. Magne was at the National Archives in Oslo yesterday, to seal the final box in the time capsule project Til Ungdommen (see earlier news stories here and here). Magne’s sculpture consists of 30 layers of aluminum on top of each other, made to resemble archival boxes. They contain letters from students all over Norway, who have shared their thoughts about the events of 22 July and about Norway today and in the future. The sculpture also features a lot of words that students have punched into the aluminum plates. “One thing I really liked about this project, was that it wasn’t my own project. It was a project that I could help facilitate, but was basically driven forward and completed by the students themselves”, Magne told Aftenposten. The time capsule will remain sealed until 2031. More pictures can be seen on Facebook and Instagram. Morten has been interviewed by German magazine Jolie, in connection with his current single “I’m The One”. 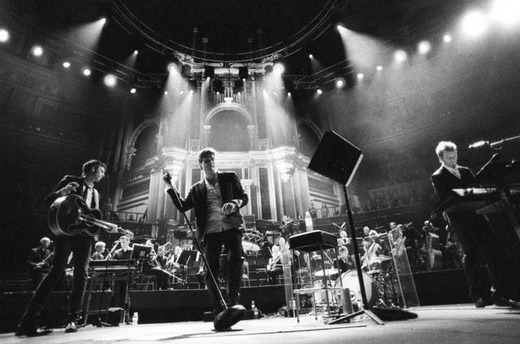 “That’s true, and I like the contrasts in it: a playful melody with more serious lyrics. The song is about finding out who you are and that it’s OK to make mistakes in life. A human is a complex being and has to make compromises when interacting with other people. 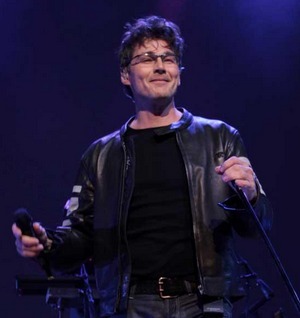 But only if you are honest with yourself and take conscious decisions”, Morten says. – The main character in the music video for “I’m The One” is a drag queen – what do you want to tell us? – You bake them yourself? The whole interview is available at jolie.de. “I’m The One” was released three weeks ago, but has failed to enter the German top 100 singles chart. Picture from YouTube video. 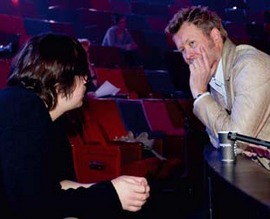 Magne on the left. Magne was at the Museum of Contemporary Art in Oslo yesterday, as Apparatjik hosted a very different Christmas concert entitled apparatjik xmess extravaganza: santa bells bob. 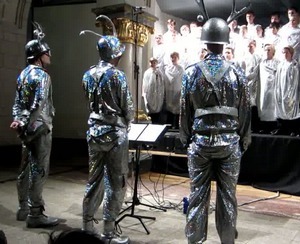 Based on the Apparatjik installation Everybody is a composer, where the movements of museum visitors were recorded and turned into music, the composition was performed by the boys choir Sølvguttene. You can see a video clip from the performance on YouTube and a gallery on Flickr (by Alyssa Nilsen). “This is a Sølvguttene Christmas concert, done Apparatjik-style. We’re calling it a “xmess extravaganza” because we prefer big words over smaller words. They are easier to notice”, Magne told Aftenposten. “For us this is definitely a form of extreme sport, a musical meeting between anarchy and strict order. But the kids just think this is fun. They don’t care as much about following familiar patterns as adults do, and like trying new things”, the choir’s conductor, Fredrik Otterstad, said. As previously mentioned, two “Desembertoner” Christmas concerts will be held at Oslo Domkirke on December 21st, where Magne is one of the musicians taking part. He will be performing together with Martin Halla and Tini Flaat Mykland from The Voice. TV2 in Norway has now announced that it will broadcast a 1-hour version of the concert the following day, on December 22nd at 22:10. It will also be repeated on December 29th at 12:45.